We are hosting Thanksgiving this year, usually my parents host and it is a grand and formal affair. When everyone sits around the table we chat, catch-up, and share a little about our year. I love spending the holiday with my family, and my mother is an amazing host. However, I am not my mother, and my style is much less formal. So this year I am choosing to do things my way instead of trying to out-do my mother at something she is far better at. I have already chosen to seat everyone family style — no kids table. I want the kids to be a part of everything. After all — why should they be separate? Since I am including them I am of course making the table a little less cluttered and more fun to keep the kids involved. I am going to create a special place-mat for everyone. I found this place-mat at Teachers-Pay-Teachers and felt it was the perfect thing to add to my more casual table setting. I am also going to include a small bucket of crayons at each end of the table so that everyone can color and write on their place-mat. I am hoping that everyone is willing to share what they write at the table when we are eating. It will be a great way to learn a little bit about what means the most to everyone in the family. You can learn a lot by what a person is thankful for. Hopefully this helps us all get just a little bit closer this holiday season. 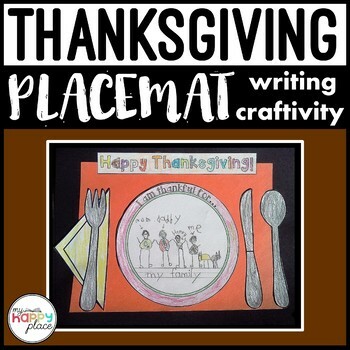 This entry was posted in Activities and tagged Activities, activity, dinner, family, Teachers pay teachers, thankful, thankful activity, thankful placemat, Thanksgiving, thanksgiving placemat, the boys store on November 10, 2018 by Lacy. Many of our kids are back at school this month. This means they are back to the daily grind of making friends, doing math, reading, playing, and in some cases interacting with bullies. Now not everyone deals with bullying head-on. Some kids are being bullied, some kids are witnessing someone being bullied, and some kids are the bully. We are not here to judge. Kids are human. They have bad days, bad weeks, and bad lives. They are immature, uneducated, and in many cases being guided improperly or not at all. So it is understandable that bullying exists in their world. It is a part of learning how to deal with emotions, other people, and the world around them. Now when it exists into adulthood is when it is an obvious problem and in many cases a choice or lifestyle. In many cases, with kids, it can be helped or prevented. As parents, we can make our kids aware of the damage caused by bullying. The damage it causes to the victim and the bully, and to the people around them. Bullying comes in many forms, physical, emotional, and cyber are the main ones in childhood. Girls tend to stick to gossip, rumors, and leaving other people out. In today’s world, this can happen in person at school, sports, activities, neighborhoods, and on the internet. However, girls are perpetrators of physical bullying as well. Boys tend to be more physical than emotional but can use both. Combating bullying can be difficult. One of the major ways it has been found to be effectively dealt with though is addressing it before it starts. 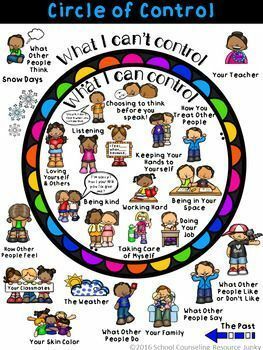 This means making sure all kids understand the results of their behavior and treatment of others. Teachers Pay Teachers has an excellent tool for kids to address their actions before they do or say something. This little acronym addresses the things you should consider before saying or doing something. 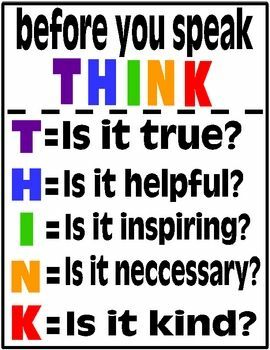 It is a quick reminder to THINK before you speak. If you have a student going back to school, or you are a teacher preparing a classroom try printing or ordering this little sign. It is an excellent reminder to try to be kind and not hurt others, even if we don’t mean to hurt them. Here at The Boy’s Store, we hope that everyone has a safe and fun new year at school and that everyone THINK’s before they speak! Enjoy! This entry was posted in Health, Learning and tagged Back-to-school, Bullies, bully prevention, Bullying, cyber bullying, education, Health, learning, School, students, teachers, Teachers pay teachers, the boys store, think, think before you speak on August 13, 2018 by Lacy.